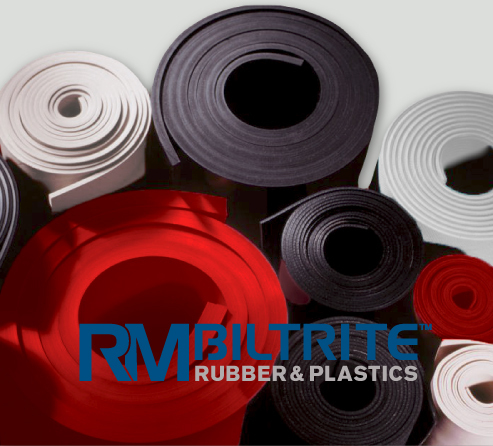 RM Biltrite™ provides an extensive range of industrial sheet rubber products, from basic commercial compounds to highly technical sheets for stringent specifications. All industrial sheet rubber products are available to order in rolls, tiles, and plates. RM Biltrite™ can also produce customized rubber compounds for specific customer needs. Avoid product contact with hydrocarbons, solvents, acids, and alkalis. The information, figures, calculations, test values and data contained in this page - which RM Biltrite™ uses to best advise our customers - correspond to current engineering standards. This data is the result of many years of research through tests and trials. As individual operating conditions influence the application and integrity of each industrial rubber sheet, the information in this site can only be used as a rough guideline. In the individual case it is the sole responsibility of the customer/user to evaluate requirements, particularly whether or not the specified industrial sheet rubber properties are sufficient for use. Qualified engineers at RM Biltrite™ are available to discuss difficult problems and questions you may have. As RM Biltrite™ cannot have any influence over how our products are used, they are used entirely at the user's own risk. We do of course guarantee the quality of our products according to general sales conditions, which are available upon request. Conditions are subject to change and error, and listed properties are guiding values.